p3 - Persuasion, Perseverance, and Patience: Sunday morning toons: Does that Big Dog hunt anymore? Sunday morning toons: Does that Big Dog hunt anymore? Although there's certainly some truth to Rob Rogers' Hillary/Bill cartoon, the ugly legacy of Bill's 1994 crime bill is (for better or worse) something that might possibly get chased off the screen by the next shiny object of the Democratic presidential primary (such being the state of American political awareness in the 21st century). But Bill's ongoing real-time capacity for saying the worst possible thing at the worst possible moment reminds us all of Hillary's ability to pick some of the worst campaign spokespersons imaginable. Memo to the Big Dog: The triangulation strategy behind the original Sister Souljah moment hit its sell-by date two decades ago. Pierce is right: Bill's lost his game. On another Clinton-related note: Toons depicting Hillary sprinting ahead of or standing in front of a line of FBI agents have been going on for over a month. If that was your entry today, you didn't make the cut. Today's toons were selected via a sucker-punch fight in the audience from the week's offerings at McClatchy DC, Cartoon Movement, Go Comics, Politico's Cartoon Gallery, Daryl Cagle's Political Cartoons, About.com, and other fine sources of toony goodness. p3 Picks of the week: Mike Luckovich, Signe Wilkinson, Jeff Danziger, Gary Varvel, Darren Bell, Wolfgang Ammer, Stuart Carlson, Robert Arial, and Monte Wolverton. p3 Award for Best Adaptation from Another Medium: Jeff Stahler, Matt Wuerker, Taylor Jones, and R. J. Matson. p3 Certificate of Harmonic Toon Convergence: Chip Bok and R. J. Matson. Ann Telnaes looks at Hillary's biggest liability – and how to fix it. Mark Fiore appreciates the joke of Paul Ryan as the White Knight. Or as the serious sensible guy. Or as the moderate. Tom Tomorrow's Sparky the Penguin and Chuckles the Sensible Woodchuck find something they can agree on about Campaign 2016. Keith Knight has all the luck – moves from California to the First In Flight state just in time for this. Reuben Bolling continues his meditation on what the2016 GOP primary season would be like if it was a production of Universal Pictures from the 1930s. Elizabeth! Stand beck! Red Meat's Old Cowboy has a real mess on his hands. And whatever you're expecting, it's not. Comic Strip of the Day talks about childhood dreams and grownup failures of imagination. Totally got this one; I remember my parents standing me out by the barn one chilly October and helping me spot Sputnik as it slowly crossed overhead ("There! No, not that one – it's moving, see it? There!"). And there was listening to the Mercury launches on a radio the teacher brought into class for the day, and . . .
And brother, when it disintegrates, it disintegrates! Cycling home late last night, I saw Mars shining brightly in the clear southern sky. Here's an oldie but goodie prompted by that sight. "Duck Dodgers in the 24 1/2th Century," produced in 1952 and released the following summer, finished at #4 on the list of the 50 greatest cartoons of all time, and – I did not know this until now – was awarded a post-mortem Hugo Award in 2004. It only indirectly involves Mars, but it did involve the third golden-age appearance of Marvin the Martian, in his only encounter with Daffy Duck; the others were with Bugs Bunny. (And, as I've pointed out before, it was Chief Michael Garibaldi's second-favorite thing in the universe.) Watch "Duck Dodgers in the 24 1/2th Century" on Daily Motion. Ex-Oregonian Jack Ohman celebrates progress. Sort of. 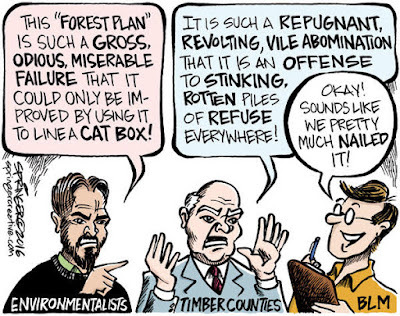 Documented Ex-Oregonian Jen Sorensen exposes the outrage represented by foreign shell companies helping citizens and corporations hide ungodly amounts of money from tax liability. Matt Bors looks at a typical day on the NewYork subway. Jesse Springer points out one of the worst reasons – in my opinion, not his – for think a policy is a bad one. Test your toon-captioning powers at The New Yorker's weekly caption-the-cartoon contest. (Rules here.) And you can browse The New Yorker's cartoon gallery here.